You wouldn’t survive a stint on the hellish early Earth that existed between 2.5 billion and 4 billion years ago. There was almost no breathable free oxygen, for one thing. But scientists may have located an ancient oxygen oasis that existed prior to whatever event first oxygenated our atmosphere. A team of researchers analyzed pyrite, aka fool’s gold, found in a South African rock formation thought to be the remains of an ancient tide pool. 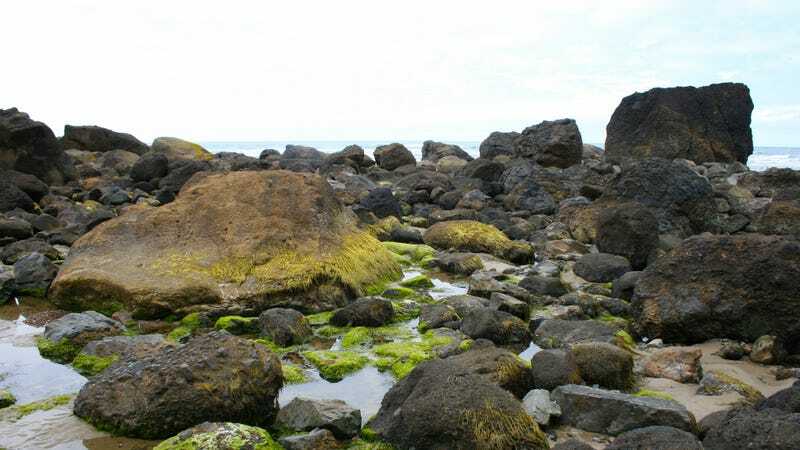 Comparing the different isotopes (same element, different amount of neutrons in its nucleus) of sulfur and iron revealed evidence of oxygen in these “near-shore shallow-marine” environments, despite an overall oxygen-less atmosphere. This suggests that early life could have formed prior to whatever “Great Oxidation Event” resulted in the higher oxygen levels in the atmosphere that allowed life to flourish. “Photosyntheseis must have been evolved,” study author Benjamin Eickmann from University of Tübingen and the University of Johannesburg told Gizmodo, “because photosynthesis is the only process that is capable of accumulating free oxygen to an extent that this oxygen could have formed these oxygen oases.” He thought that some bacteria must have been present to produce the oxygen. Scientists commonly use ratios of different elemental isotopes preserved in rock samples as proxies to understand the elements on Earth during its early years. In this case, the pyrite’s sulfur and iron isotopes contained the signature of oxygen in the shallows of the ancient oceans, despite the fact that the overall atmosphere didn’t have oxygen. They published their paper recently in Nature Geoscience. Maya L. Gomes, writing a commentary for Nature Geoscience, pointed out that the study relies on the assumption that the pyrites actually preserve information about this kind of near-shore environment, which may not be true. And confusingly, the signatures demonstrate the oxygen decreasing before the Great Oxidation Event left its mark on ancient sulfur. But the research presents some important evidence, writes Gomes. “Eickmann and colleagues provide further geochemical evidence to suggest that oxygen releasing cyanobacteria were present and active long before the Great Oxidation Event.” In other words, there could have been life around before there was oxygen in the atmosphere.